An opportunity for students to meet University Health Center staff and learn about their various careers in health and wellness. Our panelists for the spring term panel include Ariana White, a medical technologist, Craig Davidson, a physician, and sports medicine, Eric Chapman, a psychiatrist, and Karen Woodsen, a family nurse practitioner. Food and refreshments provided! 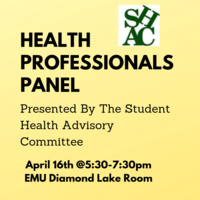 Presented by the Student Health Advisory Committee.